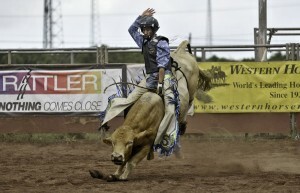 Bull rider Troy Gomes, of Kona, in the Hawaii Island High School Rodeo. Photography by Jock Goodman. 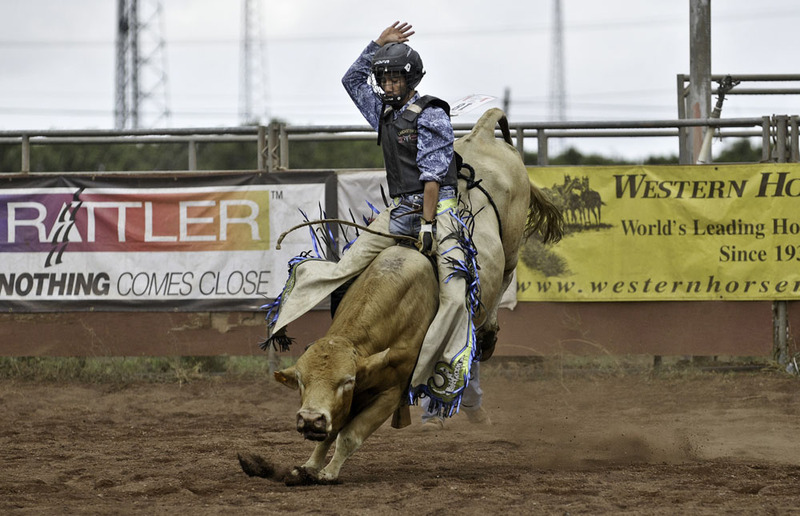 WAIMEA, ISLAND OF HAWAI’I — Hawai’i residents and visitors are invited to witness first-hand what has been called “America’s original extreme sport” – bull riding – during a free public clinic conducted by several of the top members of the exclusive Professional Bull Riders (PBR) organization at Parker Ranch’s Paniolo Park on Fri., June 24, 2011. Registration to participate in the clinic begins at 11 a.m. The clinic will run from noon to 4 p.m. There is no charge and everyone’s invited. Nationally recognized big money PBR bull riders, McKennon Wimberly and Sean Willingham, and stock contractor Mesa Pate will partner up with the Paniolo Preservation Society (PPS), Parker Ranch Round Up Club and Hawai’i Tourism Authority (HTA) to introduce this popular, adrenaline charged sport featuring powerful bulls provided by South Point Buckers. By co-hosting the clinic, Parker Ranch Round Up Club will earn a contribution to its annual scholarship program which benefits the children of Parker Ranch families. Likewise, PPS will fulfill its not-for-profit mission by creating an opportunity to share Hawai’i’s unique ranching story with PBR’s vast national and international television audiences. 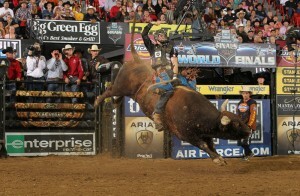 Also, “PPS, PBR and HTA hope to create interest in bringing an action-packed PBR event to Honolulu’s Aloha Stadium. Such an event would benefit both Hawai’i’s visitor and diversified agricultural industries while continuing to help perpetuate Hawai’i’s unique paniolo culture and heritage,” said PPS President Robby Hind. The bull riding clinic is one of several Hawaiian ranching events that the PBR professionals will participate in and film to share with television audiences. Other events include a branding at Parker Ranch’s Wahinekea Corral at Makahalau and a benefit lu’au with entertainment by the Beamer-Solomon Halau o Po’ohala, which in addition to hula and music has an 80-year ranching history. These events will be filmed but are not open to the public. All of the PBR Hawai’i Island events will be documented by David Neal Productions for features to be broadcast during PBR’s 2011 Built Ford Tough Series events, on television and in event arenas, as well as on www.PBR.com. The production company produces BFTS telecasts which are broadcast nationally each week on VERSUS with select events being shown on NBC and CBS. David Neal is a 30-time Emmy® Award winner and Peabody Award winner. PBR is not entirely new to Hawai’i. The organization held an event on Maui in 2006 featuring Hawai’i bull rider Myron Duarte, and on Oahu with the Hawai’i All-Star Challenge. Also, Zack Brown, who has earned over $865,000 competing in PBR events, was raised on the North Shore of O’ahu. For more information or to register to participate in the bull riding clinic, call Deedee Bertemann (325-5937) or South Point Buckers. A concession will be available during the clinic with proceeds also benefiting the Round Up Club. No coolers please; this is an alcohol and drug free event. A 501(c)3 organization, it was established to host fundraising events for youth scholarships for the children of Parker Ranch. The club will host it’s 37th annual benefit rodeo over Labor Day weekend in 2011 at Parker Ranch Arena. PBR was created in 1992 when a group of 20 bull riders broke away from the traditional rodeo scene and decided to start a circuit for bull riders only. They felt that bull riding was the most popular event in rodeo and that bull riding could stand alone. Each rider invested $1,000 to start the PBR. 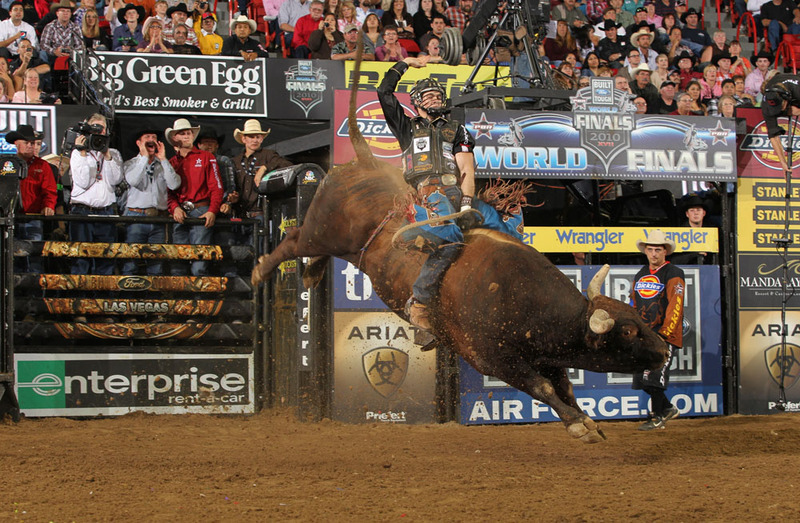 Today, celebrating its 16th anniversary, PBR is still owned by its athletes. In recent years, the PBR has celebrated milestones in organizational revenue, bull rider earnings, record-breaking performances, and media attention. It still relishes the title of being the fastest growing sport in the country. More than 1,200 bull riders from the U.S., Australia, Brazil, Canada and Mexico hold PBR memberships. They compete in more than 300 bull riding events per year on either the elite tour, which is the Built Ford Tough Series, the Touring Pro Division, or the PBR International circuits in Australia, Brazil, Canada and Mexico. The ultimate goal for PBR athletes each year is to qualify for the prestigious PBR World Finals in Las Vegas where the coveted title of PBR World Champion is decided. .
Professional bull riding is a fierce, rough, and grueling sport with roots deeply imbedded in American culture. The combination of raw sport and quality entertainment has propelled the PBR to strong growth in live attendance as well. In 1995, 310,000 fans attended PBR events across the nation. Today the PBR attracts over 1.5 million live event attendees each year with its multi-tiered event structure. During the recent seven-day PBR World Finals nearly 90,000 people attended the live show and millions of viewers tuned in at home via network and cable television domestically as well as around the world. Impressive audience numbers indicate that the PBR is making an indelible impression on mainstream America with its all star cast of the greatest bull riders and bucking bulls in the world. Established in 1998, PPS works to increase public awareness of the historical, present-day and future significance of Hawai’i’s ranching industry, with emphasis on the roles and traditions of the paniolo. Among PPS’ significant achievements have been getting Hawai’i’s most famous paniolo — Ikua Purdy — installed in the National Cowboy Hall of Fame, and subsequently securing community support to commission a Fred Fellows bronze monument honoring Purdy. The monument sits in the heart of Waimea – his ‘aina hanau (birthplace). Since its founding, PPS has acquired an extensive archival collection of historical photographs and documents, and a growing collection of Hawaiian ranching artifacts including an array of saddles, bits and spurs. Recently, PPS accepted the keys to restore and dedicate Parker Ranch’s 100-year-old Pukalani Stables in Waimea. PPS will officially dedicate Pukalani Stables as a Paniolo Heritage Center, community gathering place and interpretive repository for the proud heritage of the Hawaiian paniolo with a community blessing and open house from 4-7 p.m., Sat., June 25, 2011.